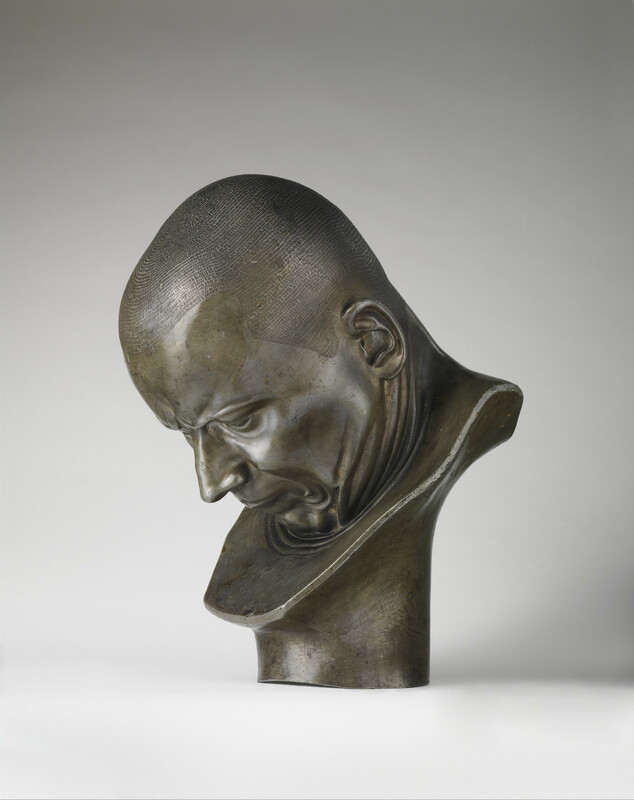 Messerschmidt, the leading sculptor at the court in Vienna in the 1760s, was forced, for personal and professional reasons, to leave for the provinces and by 1777 had settled in Pressburg (today Bratislava). There he concentrated on a private series of heads, completing more than sixty in his preferred medium of tin alloy or in alabaster. While acknowledging the artistic tradition of exploring facial expressions and emotions, these Kopfstücke, or head pieces, as he called them, were highly original for their combination of realism and abstraction. Visitors to his studio observed the artist studying himself in a mirror. Some of the heads are straightforward self-portraits, smiling or frowning; others are satirical or comic, the sitter reacting to a strong odor or yawning widely. A few, such as this one, called “refusers” by an early critic for the way they deny contact with their surroundings, are deeply introspective. simplicity, forecasting modern minimalism, and psychologically rendering serial states of mind in a project that was novel for the pre-Freudian world. Inscription: In black paint or pencil on side of cylindrical socle: VB 1876; In black paint or pencil on left side of cylindrical socle: B 188 [r]; Stamped on proper right side of cylindrical socle: 39 (number from exhibition at Vienna's Burgerspital in 1793. ); Partial labels inside the socle: one without writing, one that can be partly transcribed: "ZOL[L] . . ./WIEN . . ./94" (a customs mark). Central Europe (including Germany), 1600-1800 A.D.